The final clues came from Jesuina’s obituary. She was listed as Jessuina [sic] Gomes Fitkal. 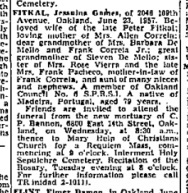 Originally I wasn’t looking for Gomes, so I didn’t see this obituary in the newspaper. She died 23 Jun 1957 in Oakland. She had a daughter Mrs. Allen [sic] Correia, grandchildren Barbara and Frank Correia Jr., and two sisters Rose Vierra and Mrs. Frank Pacheco. The obituary killed two birds with one stone. This Jesuina was the adoptive mother of Helen Pacheco who married Frank Correia. She was also the sister of Rose (Caires) Vierra and Alexandria (de Caires) Pacheco. Alexandria was my great great aunt. She was the wife of Francisco Pacheco, the brother to my great grandfather, Theodoro, and Joao Pacheco, the father of the Reds. Jesuina could now be attached to the de Caires family and rightfully designated as the person who raised Helen. On 2nd of May 1948, the Oakland Tribune newspaper noted that a marriage license was taken out for Jessie Gomes and Peter Fitkal. I have yet to look for the marriage certificate, but I assume they were married soon after. After their marriage, the couple lived in Peter’s house on 27th Avenue in Oakland. Peter died in 1954. Sometime around 1956, Jesuina was put into a rest home. She died 23 Jun 1957. This search was particularly difficult because Jesuina was known by so many names. Her nieces called her Zuweena (Suina) but her son-in-law called her Jessie. Not knowing that fact she had been previously married sent me researching in circles. It’s no wonder people forgot how she was connected to the tree. It can be challenging searching for females when you know their surname. It’s next to impossible when no surname is known. It is fortunate that Helen’s adoptive mother was named Jesuina rather than Maria. 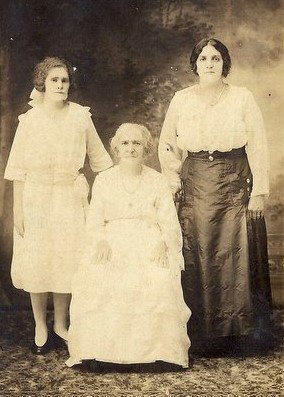 I was able to prove through the census and obituaries that Helen was the daughter of Joao Pacheco & Joana Gonsalves Cardozo and the adopted daughter of Jesuina (de Caires) Fitkal. With only the memories of cousins to go by, Jesuina was sort of a blurry figure. However, research of not only Jesuina but Helen’s birth parents and siblings verified her identity. Now Jesuina has her story back. Oakland Tribune Newspaper, Oakland, Alameda Co., CA. Obituary of Jessuina Gomes Fitkal. 24 Jun 1957, page 29, column 5. Photograph of Helen (Pacheco) Correia and Jesuina (Caires) Fitkal from the collection of Teresa Caires.